What could be better for spreading Christmas cheer than that great story about Kris Kringle winning a court case and validating his claim to be the “real” Santa Claus? We’re in luck. 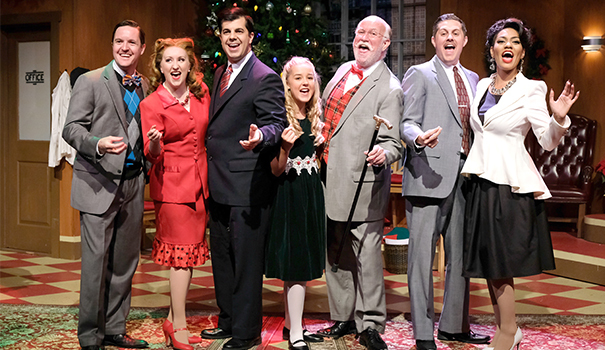 San Diego Musical Theatre revives last year’s popular musical version of the old 1947 Lux Radio Hour broadcast of “Miracle on 34th Street” through Dec. 24 in its new home, the Horton Grand Theatre. Adapted by Lance Arthur Smith, and with original songs and arrangements by Jon Lorenz, “Miracle on 34th Street: A Live Musical Radio Play,” is a great way to start the season. The problem starts when the Santa who is to march in the Macy’s parade shows up drunk, and Macy’s events chair Doris Walker (Janaya Mahealani Jones) has to find a replacement. An old man with the right look appears and is hired on the spot. This is Kris Kringle (Tim West). Doris doesn’t even believe in Santa, and has inculcated that attitude in her young daughter Susan (an adorable Cassidy Smith) as well. Santa is handed a list of overstocked toys and asked to push them to the kids. But marketing’s not his bag, and Santa has another idea: send moms to the store that has the best item wanted at the best price. When Mr. Macy finds out, he’s elated because this policy has produced oodles of goodwill for the store. Soon enough, Macy’s biggest competitor Gimbels decides to do the same thing, and before you know it, they’re in a publicity shot together. Christmas really is magic, you know? But meanwhile, Kris is having trouble being accepted as Santa. Kids have no issue, but adults (including Macy’s psychologist) are calling him a crazy, deluded old man. Someone suggests that Kris move from his retirement home closer to town, and he moves in with lawyer Fred Gailey (Matthew Malecki), who lives down the hall from Doris and her young daughter Susan. Soon Fred and Kris become good friends and all four discover a lasting bond. But Kris gets into another row with the psychologist, bops him with his cane and ends up in a holding room at Bellevue. Soon Santa finds himself in court, having to prove that he’s Santa. Of course, his roommate Fred is his attorney. It’s a delightful story, wonderfully directed by Brian Rickel and portrayed by this talented and experienced cast (all except two are returnees from last year). West’s Kris Kringle is new, amusing, kindly and winning — exactly what I’d want in a Santa. His new protege Susan is cute, smart and knows a Santa when she sees one. Lorenz’s music — especially the modern, close-harmony versions of Christmas carols — add a contempo touch to this sure-fire holiday favorite, and SDMT’s production is guaranteed to leave you with a smile on your face.